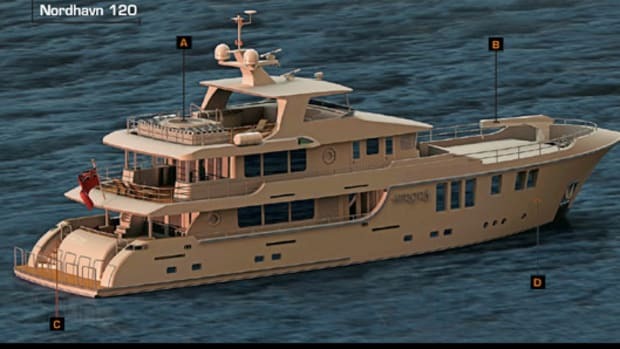 The expedition-class builder teams up with a venerated Dutch design studio known for its elegant, contemporary interiors. A Bahia Mar Hotel conference room was not the place I expected to be awestruck at last year’s Ft. Lauderdale boat show. After all, it’s a quick jaunt from the lobby to the quays lined with a number of amazing vessels. 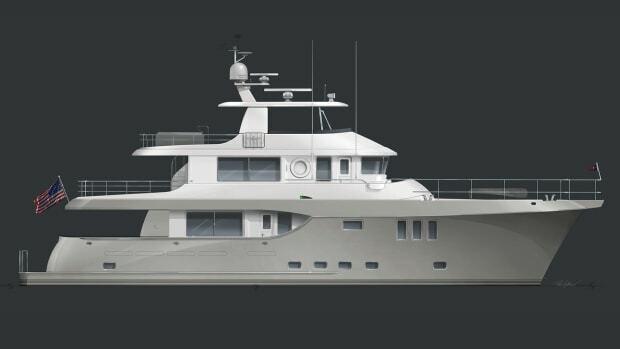 But a unique visual experience was on hand for the first collaboration between Nordhavn and yacht design studio Vripack. 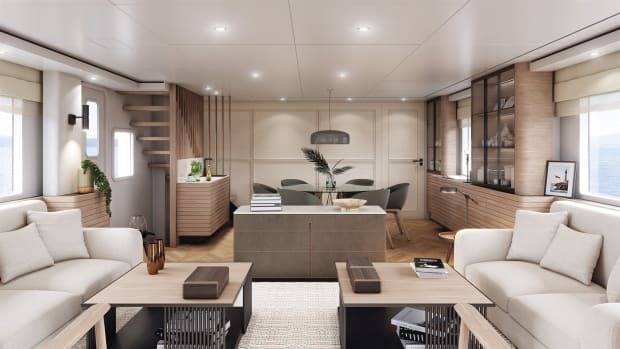 “A yacht is a finely balanced combination of elements,” Vripack Co-Creative Director Bart Bouwhuis said as he showed a display of interior finishes that would be featured on Hull No. 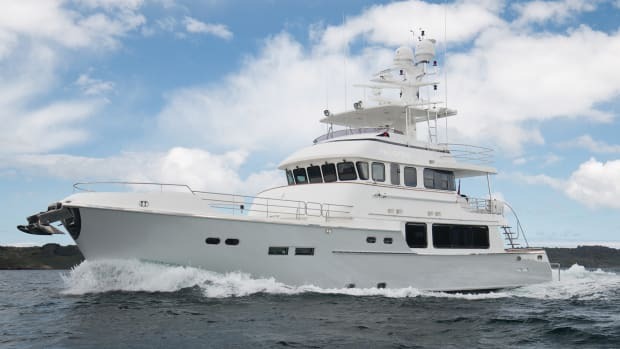 1 of the Nordhavn 80. Lush, deep-pile carpets, bespoke linens and rich leathers shared space with marble and hardwoods in light, elegant finishes. The Dutch design studio’s Hygge approach—a Danish term for coziness that engenders a feeling of contentment—is a remarkable design divergence for Nordhavn. But samples can only tell so much. And Vripack was ready to continue the story. I was immediately transported to a spacious salon that was more mid-century modern urban loft—Vripack calls it “Scandinavian chic”—than the traditional nautical American interiors that Nordhavn is known for. Light flooded in from huge hullside windows. 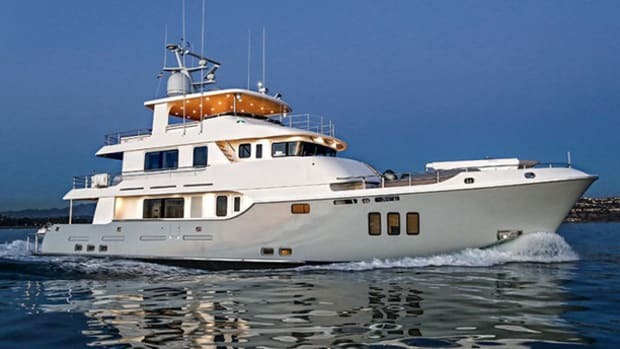 Changing views, I was suddenly in the main-deck master, its herringbone-patterned hardwood floors a fine contrast to light marble finishes and striking light fixtures. I “stood” in the skylounge as the sea beckoned far below. 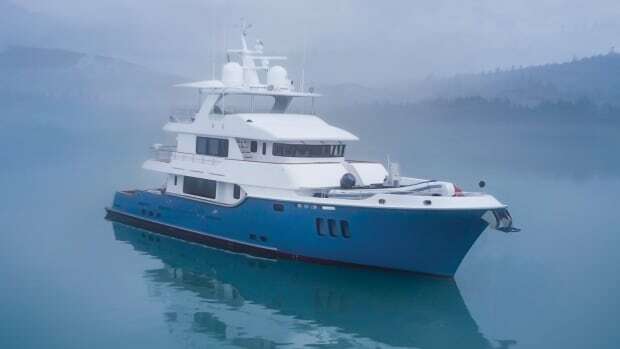 When I came across the aft deck Jacuzzi, I felt like I could almost slide right in. When I finally relinquished the headset, more than a few journalists were looking in my direction; I then realized my mouth was agape. 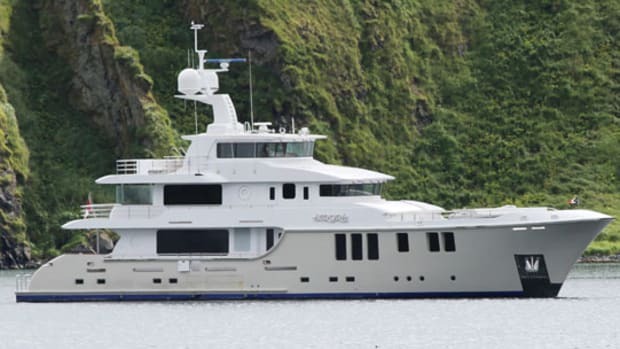 While the interior design strays far from the builder’s palette, the layout is fairly standard with four staterooms belowdecks and crew berths aft. 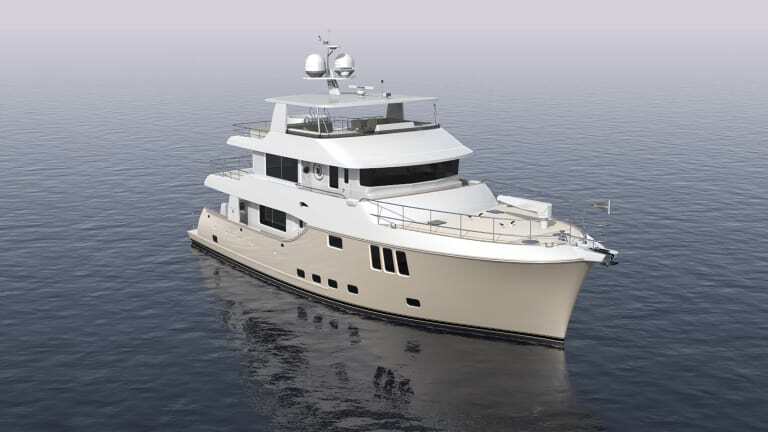 An alternate layout moves the owner suite from the main deck to the catbird seat, essentially replacing the aforementioned skylounge; captain’s quarters would then slide adjacent to the wheelhouse. 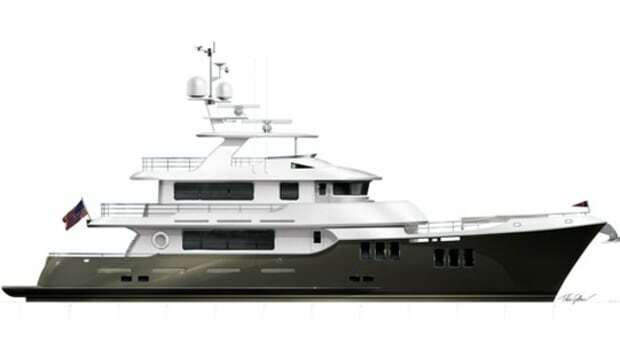 Nordhavn made its mark in the industry by building oceangoing vessels and the 80 continues that theme. 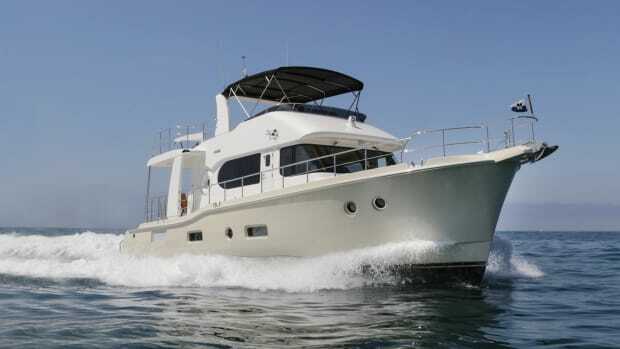 Expect the same robust systems, layers of redundancy and a full-displacement hull ready for the long haul. 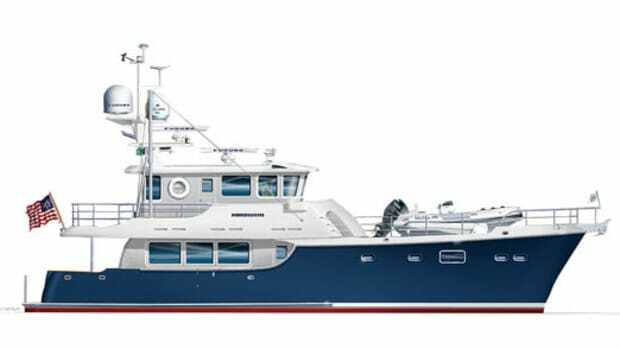 Twin 375-hp John Deere powerplants will have 4,810 gallons of diesel on tap, ready for adventure at a steadfast 9 knots. Vast bodies of water should offer little challenge.